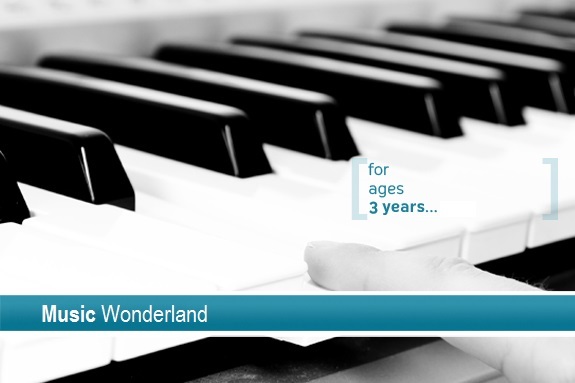 Music Wonderland is our specialised course for introducing nursery age children of 3 years of age to the world of music. Mums, Dads or Grandparents we ask you to accompany your child to this exciting forty minute lesson and join in with the singing, movement to music, storytelling activities leading to music appreciation, basic keyboard games and lots of percussion playing. Your child will sing or play along to our orchestral backing tracks enabling them to constantly improve their rhythm and sense of pulse and you get to learn about music too! The sessions are conducted in a group of up to eight children and many parents report that their child’s concentration, listening and social skills vastly improve throughout the course. The Teacher changes activity frequently throughout the course of the lesson in order to keep your child interested and stimulated. When they are four years old Music Wonderland students have the chance to graduate onto our Junior Music Course in order to further build on all the skills gained so far. This is a fantastic way to give your child a head-start so why not book a free taster lesson on Music Wonderland in order to experience this fantastic course for yourself.